Gabe’s all geared up now and ready to start learning how to balance this “not so” bike! When he sees the glider, he is a bit confused because he knows there are no peddles. He has had a bike before and ridden on 3 wheels. He knows this seems odd to have a bike with no method of movement, or at least he doesn’t understand yet he will be moving the bike while keeping his feet on the ground. 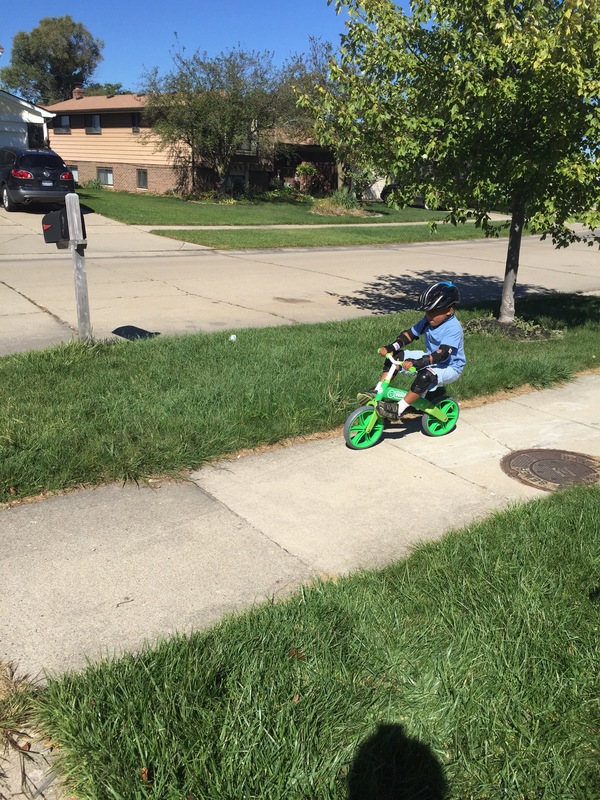 We explained to him that he must learn to BALACE before he gets a regular bike. You know what the famous question from little people are, “Why???”. So, we explain to him that if he wants to be able to ride the bike on his own, the first thing he must do is learn to balance. Peddles aren’t important if you don’t know how to stay up! 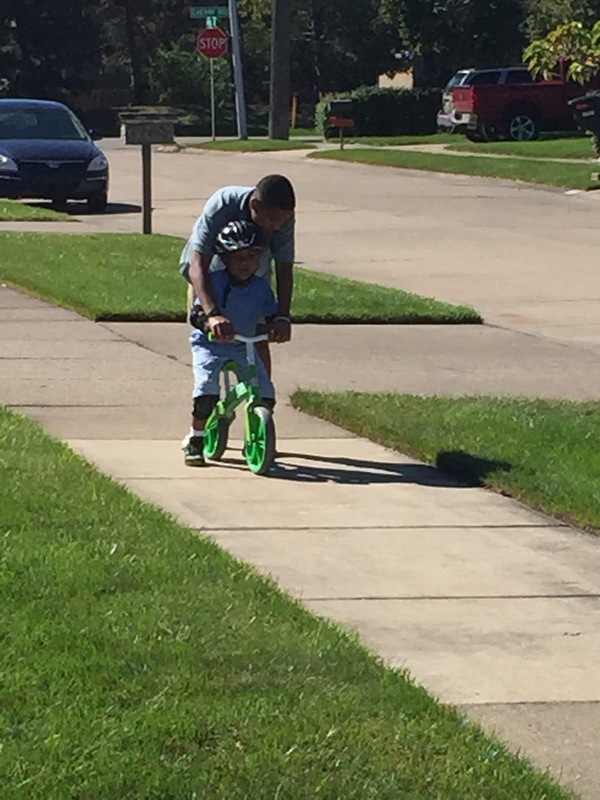 So, my oldest son began taking him outside and teaching him how to balance. At first, Israel road his bike along side Gabe to show him what it looks like to ride. Then, eventually Israel would walk behind Gabe, holding him up so he felt secure and was more willing to take chances with taking his feet off the ground. Before we knew it, Gabe was able to go off without being held up, but always looking behind to see if Israel was there. Occasionally Gabe would yell out, “Don’t let me God!!!!”. Israel would reply, “I’m right here”, and he was right behind him. Israel was so excited to see Gabe coasting along with no one holding on to him. It made him so proud, that he had to come running to tell my husband and I how great Gabe was doing! That made us so proud of them both. You know, God is so excited for us when we learn how to balance this walk of life. But he wants more than anything for us to learn how to balance. In fact that is what He loves!! He also knows that balance comes with time, and God is willing to walk along side us. He promises to hold onto us and keep us from falling, if we trust him and not be afraid to try. Balancing isn’t something that we can do on our own. It takes practice, and it takes following an example of how it’s done. It also takes trust, and surrender. God’s objective is that you ultimately are able to glide, and are protected when you fall. Check out Part 3 to find out just how good Gabe got at gliding and how pride brought his success Crashing Down!